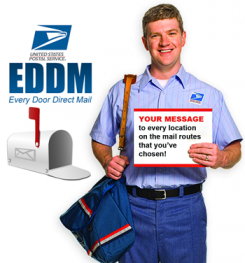 Every Door Direct Mail or “EDDM” is a service that the USPS offers where they help you reach every address in a certain area or zone. It’s a very effective way to target concentrated areas of residents or residents and businesses. The way EDDM works is you map out any area you want to target by selecting zip code(s) and then by selecting certain routes using demographic data (age, household income etc.) or by selecting the entire zip code. 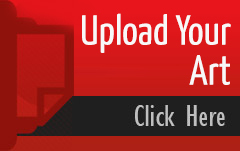 Your piece must be a certain size in order to qualify for EDDM rates. The pieces need to be put into bundles of a certain amount and combined with a Facing Slip. It is then taken to the Post Office and sent out to those areas you selected. There are two different ways to do an EDDM mailing. The first way is EDDM Retail. This means that you would do most of the work yourself. We would help you with your design and get your pieces printed and then you would select your routes online, do the bundling and deliver them to your post office yourself. EDDM Retail can sometimes be confusing for the customer to do on their own, so the other option is to have us mail through the BMEU. This way, we will do all of the online selecting of the routes and the corresponding paperwork. Mailing through us at the BMEU is a popular choice with most of our customers, as they don’t have to worry about doing much of the work and can just sit back and wait for the calls and sales to roll in. There are also instances you can save 1 cent per piece on postage when mailing through the BMEU. Another good thing about Every Door Direct Mail is that your mailpiece has to be a larger size. This allows you to fit more content onto your piece. You don’t have to purchase a Mailing List in order to do an EDDM Mailing. This is another way you in which you save. It is also very cheap to mail. The postage is quite a bit less than doing a more targeted or spread out mailing. The postage can be as low as 16 cents in certain cases but is usually between to 17-18 cents each. Every Door Direct Mail is a very popular method these days for businesses that want to reach a certain type of public. 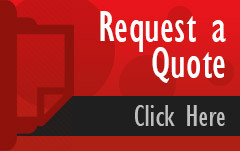 Contact us today and find out how we can help you with your next EDDM mailing. Copyright 2016 Zip Mailing. All Rights Reserved. Site Design and Development by GreatCircle Studios.